Meet GrowthBot from HubSpot Labs! When you’re growing a business, your day is filled with countless to-dos, questions, and data-pulls. These needs arise all the time and not always at the most convenient times. GrowthBot makes you just a little bit faster at doing just about anything. GrowthBot, a new experiment fresh out of HubSpot Labs, is a personal assistant for marketing and sales. GrowthBot helps you become more efficient by placing information and common marketing and sales tasks within the reach of a single message or command. GrowthBot is a chatbot - a piece of software that you can interact with, often in a conversational way using text interfaces like SMS, Facebook Messenger, Slack and others. So, instead of sending a message to a colleague asking "Hey how was organic traffic to our site last week? ", you'd be able to ask a chatbot that would then respond automatically. While GrowthBot is a very early experiment right now, here are some things you can currently ask GrowthBot to do. What tech does [website] use? How many customers did we get last week/month/year? (Google Analytics) How is traffic this week? Why build GrowthBot? Where is this going? It’s hard to avoid the discussion about messaging, bots, and how chat-like interfaces might find their way into many different aspects of our lives in the years to come. For marketers and sales teams, the rise of messaging & bots is especially important. Not only is it likely to streamline the ways we work, but it could also have a substantial impact on how people shop, buy, and interact with companies in the not-too-distant future. For the HubSpot Labs team, this feels like a big deal. 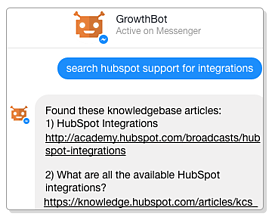 By getting started with GrowthBot, our hope is to learn both how messaging and chat can make for a better experience when using HubSpot, and the implications it has for how our customers’ prospects and customers shop and buy. GrowthBot is in early beta. Want to give it a try?